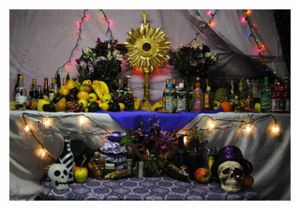 More Than 100 Graves Robbed In Benin for Voodoo Rituals - kaycee Weezy! Tomb raiders have dug up more than 100 graves at a cemetery in Benin since Saturday for what authorities suspect is a black-market trade in human organs and skulls for voodoo ritual fetishes. The incident is the most serious case of grave-robbing in the West African state, the world capital of voodoo where most of the country's 9 million residents practice a benign form of the official religion. Authorities in Dangbo, a village 10 km (6 miles) from the capital Porto-Novo, began an investigation after a mason working at the cemetery said he spotted several masked men digging up the graves, from which organs and skulls were removed. "The desecration of graves is about money in this region," said Joseph Afaton, director of the cemetery. "It is for sacrifices, or for bewitching." Body parts of humans and rare animals are prized by some people in central Africa for their supposed supernatural powers, and are used in occult ceremonies. Traffickers often obtain human remains from grave robbers, but a recent spate of killings has also been linked to the gruesome trade. Authorities in Cameroon in September arrested five people suspected of trafficking human body parts after they were discovered at a checkpoint carrying a severed human head.